14K 7.25" Ruby & Diamond Bracelet,2.9550 ct diamonds. 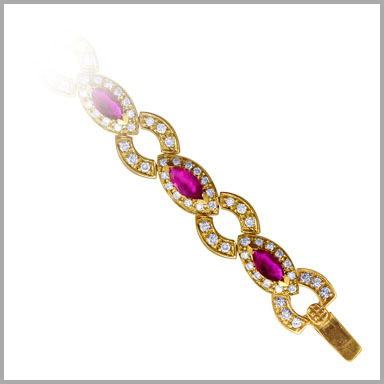 This bracelet is crafted in polished 14K gold and features 11 marquise cut rubies in prong settings. It also features 197 round full cut diamonds in prong settings. They surround the rubies with brilliance and encrust the links for added beauty. Make a statement every time you slip it on. The total ruby weight is 5.17ct and the total diamond weight is 2.96ct (both approximate).G-H in color and SI in clarity. It measures 7-1/4"L x 1/4"W and has a box clasp with a safety guard.